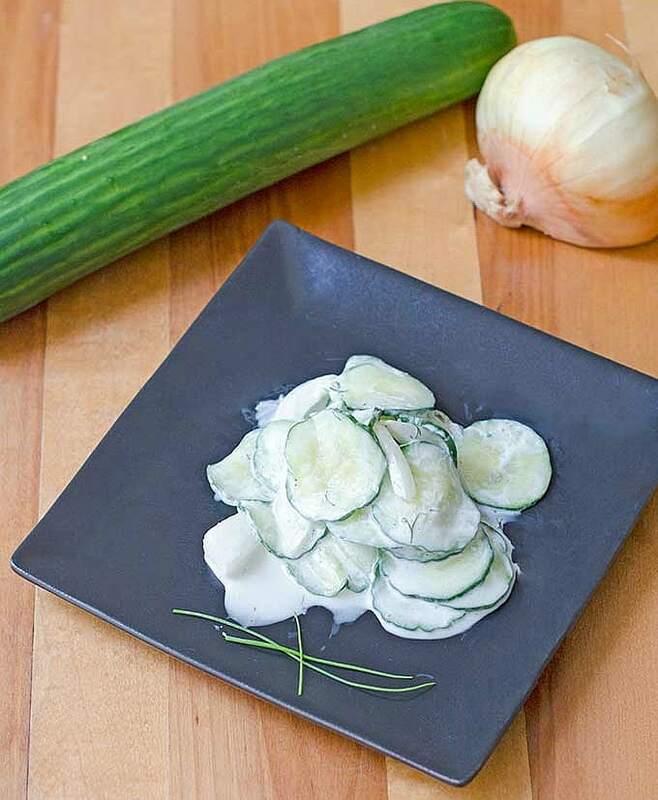 This creamy cucumber salad recipe, also known as gurkensalat in German, is cool, creamy and oh so refreshing for the warmer months. Growing up, my family had a raised postage stamp garden just about every year. What they say is true – it’s really amazing just how much better home or locally raised produce is than what you buy from the grocery store! It’s also pretty impressive how much produce you can get from just a few plants. Each summer I couldn’t wait for all the fresh squash, zucchini, and, my favorite, cucumbers. We often ate them sliced with dinner, on a sandwich for lunch or tossed into salads and still had enough to give away to friends and family. Mr. Savvy is a bit pickier than me in what he likes to eat, especially when it comes to veggies. Luckily, he loves cucumbers too. In fact, I hadn’t even made this cucumber recipe before I met him. He was born and grew up in Germany until he was 9 or so and gurkensalat, or creamy cucumber salad, was one of his favorite side dishes. When we moved to Hampton Roads, VA a few years ago, he immediately found this awesome German restaurant, which of course had the cucumber salad he loves. So, after trying it, I wanted to recreate it at home. After a few tries to perfect the recipe, he asks me to make this cucumber salad year round! 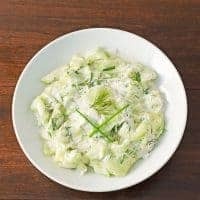 The creamy cucumber salad recipe is super easy to make with simple ingredients blended together to make a deliciously fresh side dish. This cucumber salad can take a while to make but is very little work and so worth it. I find it’s very important to let the cucumbers sit with the salt to create the right texture. You can also peel the cucumbers or not. I like it both ways, but Mr. Savvy prefers them peeled. The peeled the cucumbers get a bit softer, while if you leave the skin on, they stay a bit crisper, but the salad is traditionally supposed to be on the softer side. Even though I’ve been cooking since I was a child, I’ve never been a knife master. As such, I highly recommend a mandoline for the cucumbers and onion unless you’re really good at slicing paper thin. I really love the Oxo Good Grips Mandoline as you can easily adjust the size of the slice and it comes with a variety of blades. You’ll also want a strainer for your salted cucumbers to sit and drain in. I also like to store the salad in these 9-cup Rubbermaid containers so I can give the salad a shake now and then to make sure everything gets evenly coated. 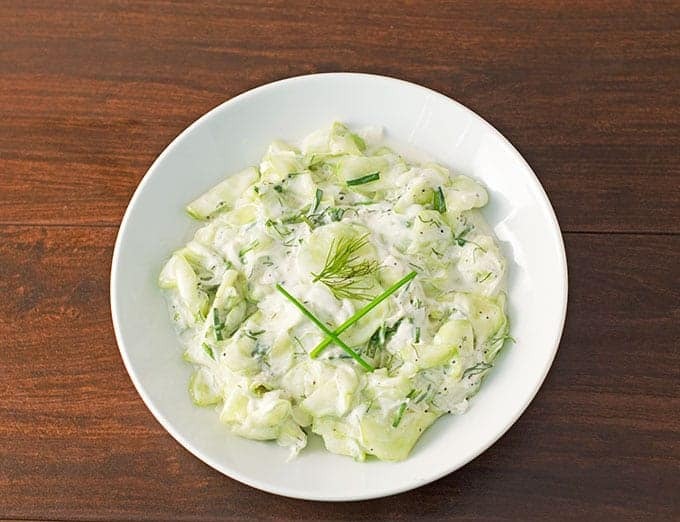 This creamy cucumber salad, or gurkensalat recipe, is a great cool and refreshing side dish for the warmer months! Wash cucumbers and then peel if desired. Peeled cucumbers will be a bit softer while unpeeled will be a bit crisper. If using pickling cucumbers, you'll definitely want to peel as the skin is too thick. Very thinly slice cucumbers and onion (cut in half), about 1/16" or 1.5mm thick, where you can almost see through the slices. A mandoline makes really easy work of this. Place cucumbers and onion in strainer and sprinkle with about 1 teaspoon salt and toss to coat. Let sit over a bowl or clean sink at least 30 minutes, but preferably an hour or more, so excess water can drain. If you don't do this the cucumbers won't soften as they should, and your salad can end up very watery. Once cucumbers and onions have softened, lightly rinse and squeeze out any excess water, allowing to drain on a paper towel while you make the dressing. In a large container or bowl, mix together sour cream, sugar, vinegar, dill, chives and garlic. Add in cucumber and onion and toss to coat evenly. Season to taste with salt, pepper, and any extra sugar, vinegar or herbs. Cover and store in the refrigerator for several hours before serving, preferably overnight. Salad will keep in refrigerator for several days, though it will begin to get watery the longer it sits. Change up the flavor by adding different herbs. You can also use dried herbs, just use 1 teaspoon instead as dried herbs are more potent. 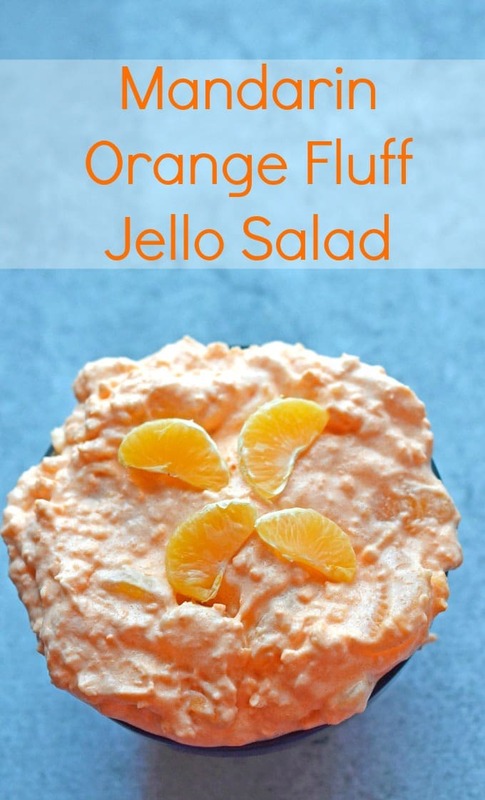 If you enjoyed this Creamy Cucumber Salad recipe, be sure to check out our Mandarin Orange Jello Fluff Salad recipe, too! This is very close to the recipe that I use except I don’t care for dill and never tried the chives and garlic.